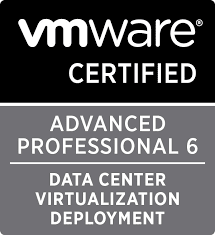 Last week I passed VMware Certified Advanced Professional 6 - Data Center Virtualization Deployment exam, the Journey was awesome and indeed require a lot of dedication and hard-work . Dedicated this blog post to help fellow community members who are preparing for this exam, the article talks about my exam experience and also provides the list of Books, Blog's and other sources I referred while preparing for this exam. I booked my exam for Thursday afternoon and reached the exam center 1.5 Hours before my exam slot ensuring I have enough time to relax and if in case there are some technical issues with exam center I should be aware of them well in hand and this is something I highly recommend to all fellow community members who are planning or preparing for this exam ensure you reach early on your exam day. Again it's not mandatory to reach exactly 1.5 Hours before :-) reaching 45 mins before your exam slot would give you enough time to prepare yourself and will help you save a lot of time when writing your exam, for sure no-one want's to waste their precious time using washroom during the exam :-) It's a long exam and preparing yourself well in advance will help you save a lot of time. When starting your exam stay extra cool as you may have to spend some time understanding and adjusting the desktop resolution as per your preference and loosing patience is something which is not going to help. I spent almost 15 Mins in understanding the overall look and feel of exam and adjusting the screen as per my preference, would highly recommend everyone to visit Hands on Labs and test out few labs which will give you a brief idea on how to deal with the desktop during the actual exam. When writing VCAP6-DCV Deploy exam every seconds count and if you are spending time reading the questions throughly before starting the task it's going to be beneficial at-least it was in my case because I was able to save a lot of time when doing the tasks. Be aware that CRTL, ALT and BACKSPACE are not working go back using arrow keys and then press delete it's better to make use of on screen keyboard if you wish to copy and paste. 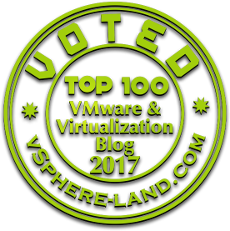 Being a VMware Certified Instructor I deliver a lot of VMware vSphere courses and consider them as the foundation for writing VMware Exams, because these courses are properly aligned with exam blueprint and they not only give you the knowledge that you need but also give you various scenario to practice in a lab based environment. Apart from VMware vSphere Design and Deploy fast track v6 course which is recommended training before you write this exam,There are few more trainings course that I personally recommend all to attend VMware vSphere 6 Optimize and Scale and VMware vSphere 6 troubleshooting workshop I learned a lot of great technical stuff at the time I attended and while preparing for delivering these courses. If you are preparing for VCAP6-DCV Deploy exam make sure you align yourself with exam objectives and simulate every objective in your Home Lab environment. If you are not too sure on how to simulate the objectives in your Home Lab environment then here is the blog post you should refer VCAP6-DCV Deployment Guide, If you are one of those who has not yet deployed your Home Lab believe me you have a long way to go, I have dedicated a couple of articles which talks about Home Lab deployment here is the link for your reference My New VMware Home Lab is Spinning. As I quoted above it’s was a long journey and a lot of dedication and hardwork is required to achieve these credentials, below are some of the technical guides which I referred while doing the preparation and strongly recommend all to go through before you write the exam. Passing the VCAP6-DCV Deploy exam need a lot of efforts and can be achieved by properly aligning yourself with exam objectives and simulating them in your Home Lab. Once you have practice these objectives multiple times in your Home Lab you are good to go, but as I said going through the objectives is one thing and the other important aspect is to stay cool and calm while writing your exam, read the question twice and understand the requirements before you begin with the task. Congratulations, I think it's very difficult to pass the exam by reading the questions two times, the exam is very intensive and very rare to answer and finish all the questions. I got bad experience with time management on this exam, I mean i can pass it but managing the time to answer the 26/27 questions is a little challenge for me. Thanks for sharing your wonderful experience. True, Time is something to be taken care when writing the exam, I was able to save some time during the deployment after going through the question twice :-) which helped me not to look for question again..